Spring is here and that means rain and more rain. If you have a basement that has been waterproofed and has a sump pump you should be in good hands, if you don’t, then flooding should be on your mind. 60% of homes with basements will have water at some point. After a flood in your home occurs the first step is to remove all the water from the area. Use a portable sump pump or wet vac to soak up all the water (you can rent these from most hardware stores). Mold will grow on anything that has been exposed to water. Destroy any furnishings or drywall that has been exposed to the water for a long period of time. Some items can be salvaged by cleaning. After the water is completely out, makes sure you dry the area out with fans and a dehumidifier (close windows with a dehumidifier running). How do you clean the mold on your basement walls? 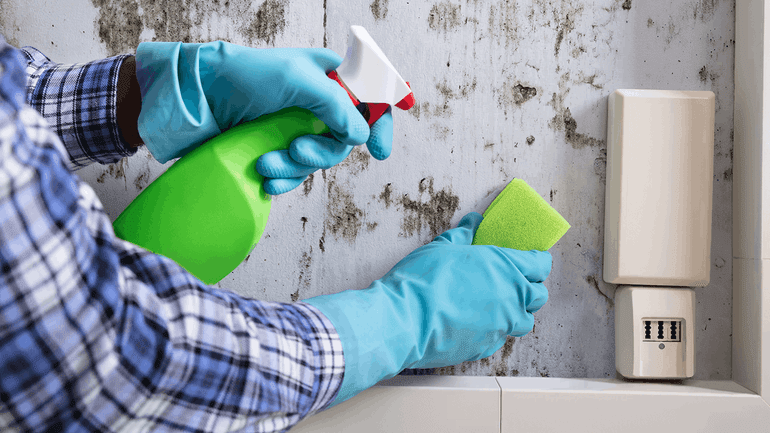 After you have removed all the items that have mold on them it is time to start cleaning your walls. Depending on the make of your wall there different ways to clean up. Remove all cardboard and items that have mold or mildew on them. Scrub walls until all the mold and mildew is gone. Assess the damage and remove any drywall that is bowing, crumbling or has black splotches. Scrub walls until all mold and mildew is gone. If your mold or mildew is overwhelming you can always call in the professionals.